Dog Collars with Leather Bracelets There are 8 products. This Fancy Black Dog Collar for medium sized dogs, and the bracelet, is decorated with pretty pink and fuchsia leather patches and rivets. An attractive fancy design! 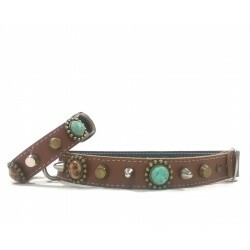 This unique Studded Collar for medium sized dogs, as well as the bracelet, have a stylish look with beautiful nature and turquoise Polaris stones . An unusual strong design! 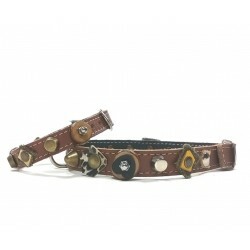 This cool original collar and bracelet are retrofitted with fabric, leather patches, rivets, ornaments and wooden discs. An exclusive and unusual very robust design. With this Designer leather dog collar and bracelet with rivets and leopard style Polaris stones, you and your dog are looking cool and trendy! 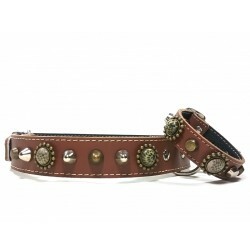 Stevon leather collar for dogs and bracelet with Beautiful Red Coral style Polaris stones - Fashionable and striking! An original medium sized collar and bracelet with beautiful red roses in ornaments and green leather leaves on black leather. Your dog and you become famous with this design!